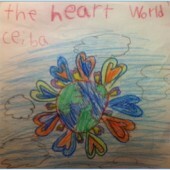 by Ceiba Azul Sherman, age 5. Bringing this issue on the connection between love and sustainability to fruition has been tremendously enriching. It has allowed each of us to more deeply explore our own understandings of two concepts that resonate strongly in our lives and scholarship—love and sustainability. It has also brought to light how broadly this topic resonates with scholars and practitioners from a variety of fields, which has been truly inspiring. The idea for this theme was born from rich conversations between faculty and students in Prescott College’s doctoral program in sustainability education. Joan was offering courses related to the arts, social justice, and transformational leadership and her work had a persistent theme of solidarity, respect, and love. As she began to incorporate scholarship related to love more fully into her teaching, students came forward to express enthusiastic gratitude for having a space to intellectually explore the varied meanings of love and articulate their own understanding of how love was significant in their work. For several years, a small community of practice engaged in collaborative dialogue on topics such as the role of love in teaching and learning, how love has influenced social movements and change, the importance of love as a value in leadership and business, love as it relates to parenting and human development, and the connection between love and environmental well-being. We found that there was a meaningful place for considering love in each theoretical and practical area we discussed. Chiara, Betsy, and Joan remained engaged in this conversation out of a clear commitment to highlighting the importance of love in the work we are each doing as sustainability educators. Chiara continues to find that a sense of connection and love are at the roots of all her inquiry into how to nurture healthy, whole people that will in turn nurture the well-being of the natural world. Betsy has observed that the most successful community-based projects have love and care in common as an essential ingredient, which inspires her research and perspective on sustainability issues. Joan continues to explore ways in which love can be included in the work we do as leaders, educators, artists, and activists, and presents her ideas in the editorial “Love in the Curriculum” in this issue. Having an issue of The Journal of Sustainability Education dedicated to the relationship between love and sustainability is a culmination of our conversation to date. We have been gratified by the enthusiastic and diverse response the call for contributions to this theme has garnered and are delighted to share this outstanding work with you. In connection with this theme love can be interpreted as love for the natural world, other than human species, each other, our children, our future, etc., and also love as the essence that connects all life, that which makes or enables systems to be sustainable. These ways of exploring love are addressed through a variety of thoughtful and fascinating scholarly articles, case studies, opinion pieces, personal essays, and artistic contributions. Our collection of scholarly feature articles includes many approaches to education as well as research into the emotional aspects of love and our relationship with life on this planet. Joan Armon and Chara Armon present qualitative research analyzing students’ responses to outdoor fieldwork with a focus on regeneration and care in their article “Cultivating Intimacy with the Natural World.” In “Sustaining Love” Mark Burch explores education for sustainability as a “psycho-cultural transformation.” June Gorman, in her article “What has Love to Do with Transformative Education?” focuses on the importance of love and emotional intelligence as an integral feature of The International Transformative Education Forum. Nathan Hensley, in “Cultivating Biophilia,” provides suggestions for how our innate capacity for connection with nature can be fostered as part of an integral curriculum and pedagogy for higher education. Clare Hintz presents “An Ecology of Love” about women farmers’ attachment to place and place meaning as indicators for active care of the land and an eco-centric perspective. “Children Voice Biophilia” is Darius Kalvaitis’ exploration of children’s love for nature from a perspective of ecopsychology and the application of phenomenological methods. Bonney MacDonald explores the language of love in the works of Terry Tempest Williams, Pattiann Rogers, and Aldo Leopold to elucidate how love is essential for environmental awareness in “To Have and To Hold.” Julie Singleton offers “Head, Heart and Hands Model for Transformative Learning” as a holistic approach for developing eco-literacy through reflection, affection, and relational knowing. “Breathing In, Breathing Out,” by Priscilla Stuckey, considers the biological foundation for sustainable economic and social life and the critical importance of relationships, reciprocity, and respect between humans as well as humans and the natural world. 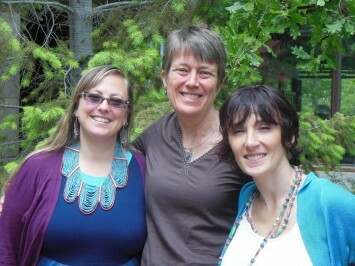 Shawna Weaver explores the healing power of relationships in “Nature-Based Therapeutic Service,” presenting a holistic approach to mental health treatment that incorporates nature connection and service in the healing process. We include a collection of case studies that range from community-based research to the application of unique curricula in classroom settings. “Cultivating Connection and Care: The Case for Family Nature Clubs,” by co-editor Chiara D’Amore, presents research on how family nature clubs can offer fundamental experiences that foster long-term care for the environment. 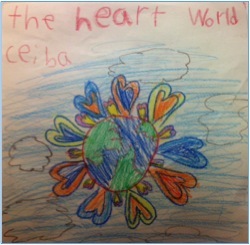 Phoebe Godfrey’s “Teaching Society and Climate Change: Creating an ‘Earth Community’ in the College Classroom by Embodying Connectedness through Love” details how a course on climate change made the connection to care and love using distinct pedagogical practices. Peggy Riehl, Nicole Tuttle, Charlene M. Czerniak, and Kevin Czajkowski offer “A Case Study in the Stewardship of Creation: Project-Based Learning and Catholic Social Teaching in a Climate Change Curriculum” as an innovative curriculum intended for teaching sustainability concepts through the lens of Catholic Social Teaching and community engagement. Our opinion pieces and editorials include co-editor Joan Clingan exploring ways in which love might be explicitly integrated into our work in “A Pedagogy of Love.” Cheryl Charles’ piece on “Love, Not Loss” offers insights from her experience as the co-founder of the Children & Nature Network on how healthy communities begin with children who experience a deeply nature-connected childhood. Duane Elgin offers his thoughts in “Love as a Great Transition Story” on how love is one of the essential cultural narratives that will help humanity transition to a more sustainable future. Co-editor Chiara D’Amore shares her review of Duane Elgin’s book, The Living Universe: Where Are We, Who Are We, Where Are We Going?, which is described as a tremendous resource with evidence from numerous fields and traditions that supports the idea of the human community as an intentional, integral part of a living universe. Co-editor Betsy A. Wier shares a book review of Kissed by a Fox: And Other Stories in Nature by Priscilla Stuckey as an illuminating example of how love and relationships are fundamental ingredients for sustainability. A selection of personal journey essays offers examples of sustainability and love in action. Jenny Finn’s essay about exploring her creative edge, “The Poetics of Vulnerability,” is a personal exploration of what vulnerability feels like within a creative process. “From Kenya with Love” is a photo essay by Jennifer Gurecki and Monica Makori illustrating how love is the essential to the success of community development projects. LeAnne Robinson’s “Sustainable Being: A Personal Journey Linking Whole Health and Sustainability Education” shares the author’s experiences in learning and living the five principles of sustainable being. “Sustainable Leadership through Loving Wisdom,” by Greg Stebbins, describes how the heart and loving are a form of regenerative power that can improve health and wellbeing. Tameria Warren’s essay “No Place like Home” describes the connection between a sense of place and love for place that necessitates care and stewardship. In addition to this excellent scholarship about love and sustainability, we also acknowledge the importance of the human emotional response to love with the incorporation of select artistic contributions into this edition. We have included photography from Rich Lewis that represents love for and in the natural world. Ellen Greenblum has shared two of her paintings that illustrate her sense of sustainable love. A poetic essay on the “Blessings of Connection and Love between Children and Nature” by Sherene Cauley describes love as both the beginning and end of connection. An “Evening Gratitude Song” is a poetic lullaby by co-editor Chiara D’Amore that appreciatively reflects on what is most important in love and life. Daniel Helman shares his poem “Finding Nature, Finding Love” in which his journey of disconnection, connection, love, and acceptance is explored. We had an exceptional team of peer reviewers: Leslie Clarke, Noël Cox-Caniglia, Julie Dunlap, Arlene M. Plevin, Jenny Finn, Marna Hauk, Clare Hintz, Abigail Lyman, Rick Medrick, Mark Minster, Marieke Slovin, and Priscilla Stuckey. We are extremely grateful for the ongoing support and love from the JSE Staff: the always gracious Larry Frolich, JSE Editor, and our exceptional and encouraging graduate assistant, Jennifer Mason. Thank you for taking our vision and turning it into something beautiful. Finally, we send a virtual group hug to our love colleagues: Daniel Eldredge, Abby Davidson, and Lenka Studnicka. Thank you for joining hands with us as we started our love train—we’re on board with you always. We hope you enjoy reading this issue as much as we enjoyed breathing life into it!